There are several great books on the subject by Buddhist Thich Nhat Hanh, author George Prochnik and explorer Erling Kagge to name but a few, as well as many Apps like Headspace and Calm – although the apps might seem an oxymoron, they did help me in that moment of need last year. 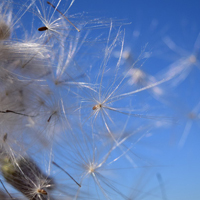 Finding the wonder in the world, as Kagge argues, “…is one of the purest forms of joy that I can imagine…”. Taking a moment to appreciate just how good our lives are compared to millions of others on the planet is an astonishingly powerful tool of escape. Personally if I feel somewhat overwhelmed, I simply stop, take a deep breath and close my eyes for a moment. That moment, if not disturbed, can roll into minutes, but it’s incredible how even such a short pause can reset the balance in a busy day. Violinist Yehudi Menuhin, who I was privileged to meet before his death, used to tell his pupils to cultivate and appreciate silence, “…musicians need it in the same way painters need a blank canvas….” Less is more, as my music producers use to tell me and I’m slowly realising that it’s true of life as well. Whatever I do, I always aim to give 100% to but if life is clogged with some much, how is that possible? Saying no leaves room for space, and space – as I’ve said many times before – is where the best ideas and creations lie, no matter what you do. I know it’s true that what we preach we most need to learn and in this regard it’s especially true for me, but I hope you’ll take time to take time also. 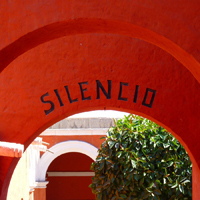 Silence truly is golden! 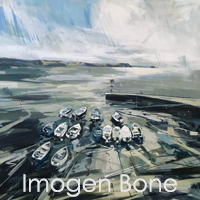 After a quiet month for the gallery, closed, but open to pack all the lovely online sales, it’s time to roll up our sleeves on another season and, boy!, have our wonderful artists been busy. 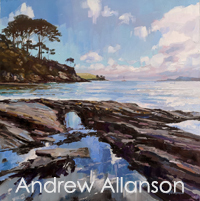 To kick off, Andrew Allanson painted this incredible work of Durgan for us. That fella’s portrayal of light and shade is quite magnificent! 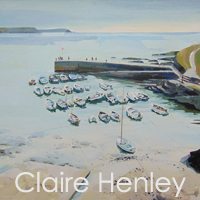 Claire Henley has been painting for us, too, to replace all the works that sold this month. More are on their way soon, but howzabout this incredible pic of Portscatho Porth for starters, eh? 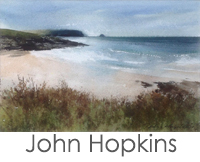 John Hopkins painted this superb watercolour for us of Porthcurnick Beach and I suspect it won’t stay long as the social media buzz over it has been huge! 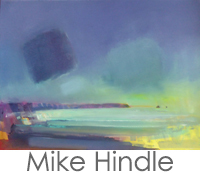 The ever popular Mike Hindle painted the first of many works with us and one sold not moments after hitting the decks. Hardly surprising given its beauty and I suspect the other two will go just as quick! 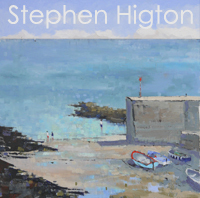 I posted The Hig’s (Stephen Higton‘s) newest piece on Wednesday and it’s already had hundreds of likes and comments. This is just the first of many he’s painting for us as I write, so if you miss this beauty, there’ll be more very soon, so keep yer eyes peeled on his page. 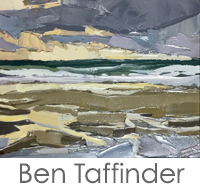 The inimitable Ben Taffinder will be popping in over the weekend with some astonishing new work. But we have buyers already waiting for his newbies, so make sure you get in there quick if you see something you like. You’ll find ’em all right here. 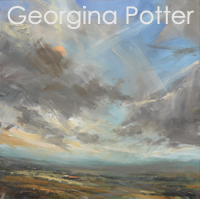 And lastly, just as we’re closing the doors on the newsletter, one of the most popular artists throughout January has been our newest painter, Georgina Potter. And I suspectthese brand new 9… yes NINE cracking paintings will fly out the door. Please take a moment to discover her new collection… it’s astonishing! just yesterday with 8… yes EIGHT incredible new paintings. Is it possible that she gets better and better? It certianly seems to with these beauties! So there it is, me lovelies. Deborah and I will be open now Wed-Sun 11am – 4pm each day throughout February but of course we’re always open 24/7 online. And if you want to visit outside of these times, just holler! A fresh New Year is a traditional time to look at one’s life and make changes for the future. They’re often health related but can also entail attitude and outlook changes.